Whole wheat flour, brown sugar, maple syrup, and less butter keep this tasty crisp as healthy as it's delicious. In a bowl, combine all ingredients for the filling. Set aside. In a separate microwave safe bowl, melt butter. Add oats, flour, sugar, and cinnamon, stirring well to combine. 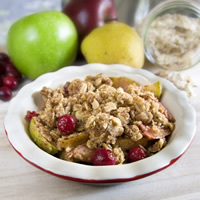 Line the bottom of a casserole dish with the apple pear mixture and top it with the rolled oat mixture. Bake uncovered for 40 minutes or until top is browned.